We have a couple of great nights lined up for you this Friday and Saturday. 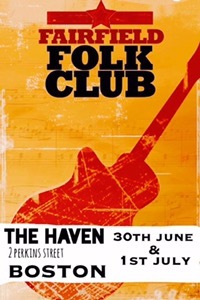 The Fairfield Folk Club from Glasgow with Mick Hargan at the helm is back in town. A lose collective of ace songwriters and charmers will bestride The Haven stage from 9-late this weekend. Come along and support Live music in a Scottish environment ffs.